The threadbare Lakers lineup will get some reinforcement Thursday in the form of Rajon Rondo, but LeBron James’ return remains unclear, coach Luke Walton said late Monday. 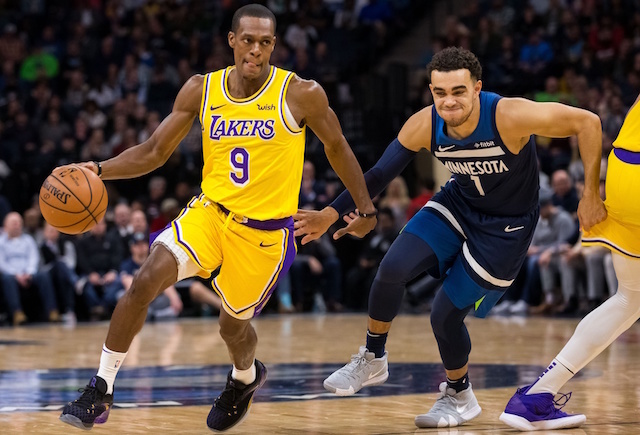 “I think Rondo will play Thursday as long as he continues to move with no setbacks until then, but that will be something that we’ll keep pushing him and we’ll re-evaluate each morning,” Walton told reporters (via ESPN.com) after the Lakers’ 130-111 loss to the Warriors. Rondo, 32, has missed 14 games after surgery to repair a ligament in his right ring finger. James, meanwhile, also has missed 14 games since straining his left groin Dec. 25. The Lakers (25-23) have gone 5-9 since Christmas Day, when both James and Rondo were injured, and have fallen from fourth in the Western Conference to ninth. With Rondo and Ball out Monday, Brandon Ingram started at point guard and had three assists but also two turnovers in the blowout.